Is The Cash-Landrum UFO Incident Solved? When it comes to UFO reports, people often witness helicopters in close proximity to unidentified flying objects. While there are several examples of this, none are more well-known than the Cash-Landrum Incident . The sighting occurred on December 29, 1980 and is one of the few cases in which the witnesses experienced adverse health issues as a result of it. In addition, it would later lead to a civil suit against the US government for damages. On that fateful night, Betty Cash, Vickie Landrum and her grandson Colby were driving home to Dayton, Texas. As they traveled down Farm-To-Market Rd 1485, a desolate stretch of road in Piney Woods northeast of Houston, Colby noticed a light ahead of them just over the tree line. Initially their first thought was it's an airplane or helicopter from one of the nearby airfields. However, once it got closer they realized this was no ordinary aircraft. 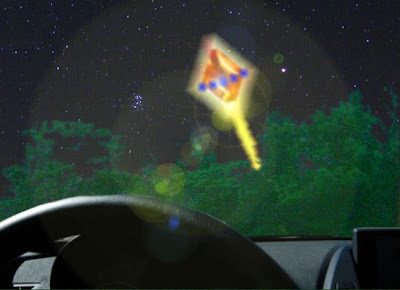 The UFO, which now hovered over the road directly in front of them, was shaped like a diamond with the top and bottom cutoff. At regular intervals it was shooting out an intense stream of reddish-orange flames from the bottom. They described it as something akin to a rocket blast. Betty had brought the car to an immediate stop to avoid driving underneath it. . . .
. . . Fast-forward almost 19 years to the day, a then secret military aircraft would soon make headlines as the result of a Freedom of Information Act (FOIA) request by the magazine Popular Mechanics. The craft, named the Lenticular Reentry Vehicle (LVR), was a nuclear flying saucer designed by the Los Angeles Division of North American Aviation under contract with the U.S. Air Force. Until then, this flying saucer had been hidden away for years under the Pentagons cloak of “black budget” secrets. The project was classified from 1962 until December 28, 1999 when it was cleared for public release. . . . The Cash - Landrum Incident | ". . . The UFO Ascended and Cleared The Treeline, The Three Counted 23 Helicopters, Some with Military Markings . . ."
Did UFO Encounter Cost Woman Her Life? I believe what I saw on the same night is related to this incident. Me, my older brother, and my dad saw something that we have kept quite about, only to speak about it with each other. We lived off FM 1960 at the time. A bright light illuminated my bedroom which woke me and my brother up. Looking out the window we saw a big bright light hovering over the tree tops moving slowly. I thought the moon had fallen. After alerting our dad we all walked outside for a better look. I recall hearing a humming sound along with a group of helicopters. We have never forgotten what we saw. We never reported this or spoke about it with anyone else. I recently decided to investigate more into what we saw that night after a recent get-together with my dad and brother, and us telling my daughter about that night. Thanks, cwtxFF for posting about this. Frank Warren alerted me about your comments, and they looked familiar. Two others have come forward in the last year, with accounts so similar, I initially thought you must have been one of them. Checking again, I see a few differences. I'd like to ask you a few questions to clarify the details. Your name will not be used without your permission. Please go to this page http://www.blueblurrylines.com/2016/12/cash-landrum-ufo-case-updates-witness.html and use the link at the bottom, Blue Blurry Lines: Cash-Landrum Case Updates to reach me. Thank you. I followed your instructions and have left my contact information.